The Villa Medicea di Pratolino (Villa Demidoff di Pratolino) is a patrician villa 12 km north of Florence, accessed from the main road to Bologna. It was built by the solitary Francesco I de' Medici, Grand Duke of Tuscany, in part to please his Venetian mistress, the celebrated Bianca Capello. The designs were by his court architect, Bernardo Buontalenti, and work was carried out in a single campaign that lasted from 1569 to 1581, though the villa was sufficiently completed to provide the setting for Francesco's wedding to Bianca Cappello. In its time, it was a splendid example of the Mannerist garden. The villa was left in ruins by Ferdinand III and Leopold II of Lorraine. It was eventually demolished and the park landscaped in the English style. Sometime later it was bought by Prince Paolo Demidoff who, in 1872, had the pages' quarters turned into the existing villa. 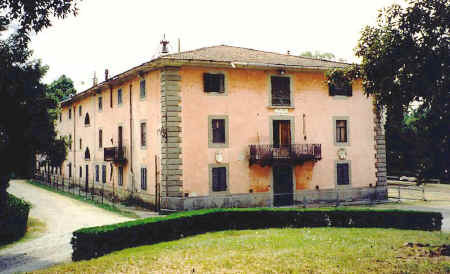 On August 4, 1981, the complex was bought by the Province of Florence for public use. The park is magnificent and in it there are the remains of artificial caves and fountains. Of the original Renaissance structure, what remains today is the colossal statue-fountain of the Apennine by Giambologna, together with the adjacent lake, the statue of the Mugnone and the hexagonal chapel designed by Buontalenti with its lead-laminated cupola supported by 14 stone columns. Dirt roads, paths and tracks run for miles through the park's breathtaking natural surroundings. 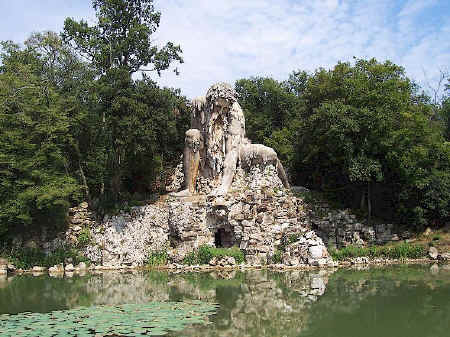 The complicated iconography of the garden, embodied in the magnificent brooding statue of Appennino (1579-1580), a colossal sculpture by Giambologna that originally seemed to emerge from the vaulted rockwork niche that once surrounded him, escape the modern visitor and puzzle the art historian. Multiple grottoes with water-driven automata a water organ, surprise jets that drenched visitors' finery when the fontanieri opened secret spigots, striking juxtapositions of Art with imitations of rugged Nature. More about the Renaissance villas of Tuscany. More about the gardens of the Tuscan villas.